For the later, variable-sweep wing bomber, see Tupolev Tu-22M. The Tupolev Tu-22 (NATO reporting name: Blinder) was the first supersonic bomber to enter production in the Soviet Union. Manufactured by Tupolev, the Tu-22 entered service with the Soviet military in the 1960s. The last examples were retired during the 1990s. Produced in comparatively small numbers, the aircraft was a disappointment, lacking the intercontinental range that had been expected. Later in their service life, Tu-22s were used as launch platforms for the Soviet Kh-22 standoff missile, and as reconnaissance aircraft. Tu-22s were sold to other nations, including Libya and Iraq. The Tu-22 was one of the few Soviet bombers to see combat; Libyan Tu-22s were used against Tanzania and Chad, and Iraqi Tu-22s were used during the Iran–Iraq War. The Tu-22 was intended originally as a supersonic replacement for the Tupolev Tu-16 bomber. Preliminary design of an aircraft to meet this requirement, designated Samolyot 105 by Tupolev, was started in 1954, with the first prototype completed in December 1957. It made its maiden flight from Zhukovsky on 21 June 1958, flown by test pilot Yuri Alasheev. The availability of more powerful engines, and the TsAGI rediscovery of the Area rule for minimizing transonic aerodynamic drag, resulted in the construction of a revised prototype, the 105A. This first flew on 7 September 1959. The first serial-production Tu-22B bomber, built by Factory No. 22 at Kazan, flew on 22 September 1960, and the type was presented to the public in the Tushino Aviation Day parade on 9 July 1961, with a flypast of 10 aircraft. It initially received the NATO reporting name 'Bullshot', which was deemed to be inappropriate, then 'Beauty', which was deemed to be too complimentary, and finally the 'Blinder'. Soviet crews called it "shilo" (awl) because of its shape. The Tu-22 entered service in 1962, but it experienced considerable problems, resulting in widespread unserviceability and several crashes. Amongst its many faults was a tendency for skin aerodynamic heating at supersonic speed, distorting the control rods and causing poor handling. 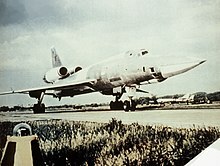 The landing speed was 100 km/h (62 mph) greater than previous bombers and the Tu-22 had a tendency to pitch up and strike its tail on landing, though this problem was eventually resolved with the addition of electronic stabilization aids. Even after some of its problems had been resolved, the 'Blinder' was never easy to fly, and it was maintenance-intensive. Among its unpleasant characteristics was a wing design that allowed rudder reversal at high deflections. When the stick had been neutralized following such an event, the deformation of the wing did not necessarily disappear but could persist and result in an almost uncontrollable aircraft. Pilots for the first Tu-22 squadrons were selected from the ranks of "First Class" Tu-16 pilots, which made transition into the new aircraft difficult, as the Tu-16 had a co-pilot, and many of the "elite" Tu-16 pilots selected had become accustomed to allowing their co-pilots to handle all the flight operations of the Tu-16 except for take-off and landings. As a consequence, Tu-16 pilots transitioning to the single-pilot Tu-22 suddenly found themselves having to perform all the piloting tasks, and in a much more complicated cockpit. Many, if not most of these pilots were unable to complete their training for this reason. Eventually, pilots were selected from the ranks of the Su-17 "Fitter" crews, and these pilots made the transition with less difficulty. By the time the Tu-22B (Blinder-A) entered service, it was already obvious that its operational usefulness was limited. Despite its speed, it was inferior to the Tu-16 with respect to combat radius, weapon load, and serviceability. Soviet leader Nikita Khrushchev believed that ballistic missiles were the way of the future, and bombers like the Tu-22 were in danger of cancellation. As a result, only 15 (some sources say 20) Tu-22Bs were built. A combat-capable aerial reconnaissance version, the Tu-22R ('Blinder-C'), was developed along with the bomber, entering service in 1962. The Tu-22R could be fitted with an aerial refueling probe that was subsequently fitted to most Tu-22s, expanding their radius of operation. 127 Tu-22Rs were built, 62 of which went to the AVMF for maritime patrol use. Some of these aircraft were stripped of their camera and sensor packs and sold for export as Tu-22Bs, although in other respects they apparently remained more comparable to the Tu-22R than to the early-production Tu-22Bs. A trainer version of the 'Blinder,' the Tu-22U ('Blinder-D'), was fielded at the same time; it had a raised cockpit for an instructor pilot. The Tu-22U had no tail guns, and was not combat-capable. Forty six were produced. To try to salvage some offensive combat role for the Tu-22 in the face of official hostility, the Tu-22 was developed as a missile carrier, the Tu-22K ('Blinder-B'), with the ability to carry a single Kh-22 (AS-4 'Kitchen') stand-off missile in a modified weapons bay. The Tu-22K was deployed both by DA (Long Range Aviation), and AVMF (Soviet Naval Aviation). Tu-22s were exported to Iraq and Libya during the 1970s. An Egyptian request was refused as a result of Soviet objections to the Yom Kippur War. 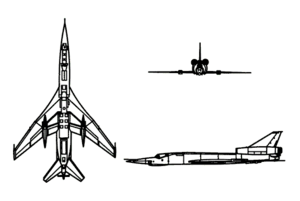 The Tu-22 has a low-middle mounted wing swept at an angle of 55°. The two large turbojet engines, originally 159 kN (35,273 lbf) Dobrynin VD-7M, later 162 kN (36,375 lbf) Kolesov RD-7M2, are mounted atop the rear fuselage on either side of the large vertical stabilizer, with a low mounted tailplane. Continuing a Tupolev OKB design feature, the main landing gear are mounted in pods at the trailing edge of each wing. The highly swept wings gave little drag at transonic speeds, but resulted in very high landing speeds and a long take-off run. The Tu-22's cockpit placed the pilot forward, offset slightly to the left, with the weapons officer behind and the navigator below, within the fuselage, sitting on downwards-firing ejector seats. The cockpit design had poor visibility compared to some bombers (doing nothing for the Tu-22's poor runway performance), uncomfortable seats, and poor locations for instruments and switches. The Tu-22's defensive armament, operated by the weapons officer, consisted of a tail turret beneath the engine pods, containing a single 23mm R-23 gun. The turret was directed by a small PRS-3A 'Argon' gun-laying radar to compensate for the weapons officer's lack of rear visibility. The bomber's main weapon load was carried in a fuselage bomb bay between the wings, capable of carrying a variety of free-fall weapons: up to 24 FAB-500 general-purpose bombs, one FAB-9000 bomb (9,000 kg/20,000 lb), or various nuclear bombs. On the Tu-22K, the bay was reconfigured to carry one Raduga Kh-22 (AS-4 'Kitchen') missile semi-recessed beneath the fuselage. The enormous weapon was big enough to have a substantial effect on handling and performance, and was also a safety hazard. The early Tu-22B had an optical bombing system (which was retained by the Tu-22R), with a Rubin-1A nav/attack radar. The Tu-22K had the Leninets PN (NATO reporting name 'Down Beat') to guide the Kh-22 missile. The Tu-22R could carry a camera array or an APP-22 jammer pack in the bomb bay as an alternative to bombs. Some Tu-22Rs were fitted with the Kub ELINT system, and later with an under-fuselage pallet for M-202 Shompol side looking airborne radar, as well as cameras and an infrared line-scanner. A small number of Tu-22Ks were modified to Tu-22KP or Tu-22KPD configuration with Kurs-N SIGINT equipment to detect enemy radar systems and provide compatibility with the Kh-22P anti-radiation missile. The Libyan Arab Republic Air Force (LARAF) used the Tu-22 in combat against Tanzania in 1979 as part of the Uganda–Tanzania War to help its Ugandan allies, with a single Tu-22 flying a completely unsuccessful bombing mission against the town of Mwanza on 29 March 1979. The Libyan aircraft were also used against Chad as part of the Chadian–Libyan conflict, with strikes into western Sudan and Chad. Libyan Tu-22s flew their first mission over Chad on 9 October 1980 against Hissène Habré's forces near the Chadian capital of N'Djamena. Occasional bombing raids by small numbers of Tu-22s against targets in Chad and Sudan, including a raid on Omdurman in September 1981, which killed three civilians and injured 20 others, continued to be performed until a ceasefire was arranged in November 1981. Fighting restarted in July 1983, with Libyan air power, including its Tu-22s, being used in attacks against forces loyal to Habré, before a further ceasefire stopped the fighting until Libyan-assisted forces began a fresh offensive in early 1986. On 17 February 1986, in retaliation for the French Operation Épervier (which had hit the runway of the Libyan Ouadi Doum Airbase one day earlier), a single LARAF Tu-22B attacked the airfield at N'Djamena. Staying under French radar coverage by flying low over the desert for more than 1,127 km (700 mi), it accelerated to over Mach 1, climbed to 5,030 m (16,503 ft) and dropped three heavy bombs. Despite the considerable speed and height, the attack was extremely precise: two bombs hit the runway, one demolished the taxiway, and the airfield remained closed for several hours as a consequence. The bomber ran into technical problems on its return journey. U.S. early warning reconnaissance planes based in Sudan monitored distress calls sent by the pilot of the Tu-22 that probably crashed before reaching its base at Aouzou (maybe hit by twin-tubes that fired in N'Djamena airport). On 19 February, another LARAF Tu-22 attempted to bomb N'Djamena once again. The Tu-22 was intercepted by a patrol of French Air Force Mirage F1Cs, and shot down 110 kilometers off Chad's capital city. One bomber was shot down by captured 2K12 Kub (SA-6) surface-to-air missiles during a bombing attack on an abandoned Libyan base at Aouzou on 8 August 1987. One eyewitness report suggests that the pilot ejected but his parachute was seen on fire. Another Blinder was lost on the morning of 7 September 1987, when two Tu-22Bs conducted a strike against N'Djamena. A French battery of MIM-23 Hawk SAMs of the 402nd Air Defence Regiment shot down one of the bombers, killing the East German crew. This raid was the last involvement of the Tupolev Tu-22 with the Chadian–Libyan conflict. The last flight of a Libyan Blinder was recorded on 7 September 1992. They are probably now unserviceable because of a lack of spare parts, although seven are visible at the Al Jufra Air Base at the following coordinates: 29°11′58.18″N 16°00′26.17″E﻿ / ﻿29.1994944°N 16.0072694°E﻿ / 29.1994944; 16.0072694. They were reportedly replaced by Su-24s. Iraq used its Tu-22s in the Iran–Iraq War from 1980 to 1988. Offensive operations started on the first day of the war, when a Tu-22 based at H-3 Air Base struck an Iranian fuel depot at Mehrabad International Airport, Tehran, which in conjunction with other Iraqi attacks resulted in a shortage of aviation fuel for the Iranians in the early period of the war. Otherwise, these early attacks were relatively ineffective, with many raids being aborted owing to Iranian air defences and operations being disrupted by heavy Iranian air strikes against Iraqi airfields. Iran claimed three Tu-22s shot down during October 1980; one on 6 October over Tehran, and two on 29 October, one near Najafabad by an AIM-54 Phoenix missile launched by an F-14 interceptor and one over Qom. Iraq deployed its Tu-22s during the "War of the Cities", flying air-raids against Tehran, Isfahan and Shiraz, with these attacks supplemented by Iraqi Scud and Al Hussein missiles. Iran retaliated against Iraqi cities with its own Scuds. The Iraqi Air Force were particularly enthusiastic users of the gargantuan FAB-9000 (9,000 kg/20,000 lb) general-purpose bomb, which skilled Tu-22 pilots could deploy with impressive accuracy, utilizing supersonic toss bombing techniques at stand-off distances and allowing the aircraft to escape retaliatory anti-aircraft fire. Usage of the FAB-9000 was so heavy that the Iraqis ran low of imported Soviet stocks and resorted to manufacturing their own version, called the Nassir-9. Iraqi Tu-22s were also deployed in the last stages of the "Tanker War". On 19 March 1988, four Tu-22s together with six Mirage F.1s carried out a raid against Iranian oil tankers near Kharg Island. The Tu-22s sank one supertanker and set another on fire, while Exocet missiles from the Mirages damaged another tanker. A second strike against Kharg Island later that day was less successful, encountering alerted Iranian defences, with two Tu-22s being shot down. These were the final operations carried out by Iraq's Tu-22s during the Iran–Iraq war. Iraq lost seven Tu-22s during the war, with several more badly damaged. The remaining Iraqi Tu-22s were destroyed by American air attacks during the 1991 Gulf War. The only Soviet combat use of the Tu-22 occurred in 1988, during the Soviet withdrawal from the war in Afghanistan. Tu-22P Blinder-E electronic jammers were given the task of covering the withdrawal route back to the Soviet Union. Radar-jamming Tu-22PD aircraft covered Tu-22M3 Backfire-C bombers operating out of the Mary-2 airfield in the Turkmen SSR on missions in Afghanistan near the Pakistani border. They protected the strike aircraft against Pakistani F-16 air defence activity and suppressed radar systems which could aid Pakistani F-16 attacks on the Soviet bombers in the border region. Tu-22PD crews were also tasked with photo-reconnaissance missions, to assess bomb-damage, in addition to their primary electronic warfare missions. The Tu-22 was gradually phased out of Soviet service in favor of the more-capable Tupolev Tu-22M. At the time of the dissolution of the Soviet Union there were 154 remaining in service, but none are now believed to be used. The Tu-22M was, according to that article, still in use in 2017. Reconnaissance aircraft, retaining bombing capability and fitted with Kub ELINT systems during the 1970s. Version of Tu-22U with refueling equipment. Libyan Air Force – retired due to lack of spare parts in early 2000s. Iraqi Air Force – received 12 aircraft. All destroyed during the Iran–Iraq War and Gulf war. Russian Air Force – retired, 10 in reserve. Russian Naval Aviation – retired in the 1990s. ^ Zaloga 1998, pp. 59–60. ^ Duffy and Kandalov 1996, p.124. ^ a b Zaloga 1998, p.60. ^ a b c d e Zaloga 1998, p.61. ^ Gunston Flight 27 July 1961, p.109. ^ Zaloga 1998, pp. 63–64. ^ Zaloga 1998, pp. 62–63. ^ a b c Zaloga 1998, p.81. ^ a b c Zaloga 1998, p.63. ^ Zaloga 1998, pp. 63–66. ^ Zaloga 1998, pp. 66–67. ^ a b Duffy and Kandalov 1996, p.123. ^ a b Zaloga 1998, p.80. ^ Duffy and Kandalov 1996, pp. 123–125. ^ Gunston 1996, pp. 430–431. ^ Zaloga 1998, pp. 67, 78. ^ "Tu-22 BLINDER (TUPOLEV)". fas.org. ^ a b Zaloga 1998, pp. 64–67. ^ Cooper, Bishop and Hubers Air Enthusiast No. 116, pp. 62–63. ^ a b c Cooper, Bishop and Hubers Air Enthusiast No. 117, p.53. ^ Cooper, Bishop and Hubers Air Enthusiast No. 117, p.54. ^ Cooper, Bishop and Hubers Air Enthusiast No. 117, pp. 54–55. ^ Zaloga 1998, pp. 81–82. ^ Cooper, Bishop and Hubers Air Enthusiast No. 117, p.55. ^ a b Zaloga 1998, p.82. ^ a b Cooper, Bishop and Hubers Air Enthusiast No. 117, p.56. ^ Adrian Roman. "Bombed by Blinders - Part 2 - www.acig.org". acig.info. ^ Cooper, Bishop and Hubers Air Enthusiast No. 116, pp. 63–64. ^ Cooper, Bishop and Hubers Air Enthusiast No. 116, pp. 64, 66. ^ Cooper, Bishop and Hubers Air Enthusiast No. 116, p. 66. ^ Zaloga 1998, pp. 82–83. ^ Perrimond, Guy. "The threat of theatre ballistic missiles: 1944–2001". TTU Online, 2002. Retrieved 26 November 2011. ^ Cooper, Bishop and Hubers. "Bombed by Blinders – Part 2". Air Combat Information Group, 2010. Retrieved 4 June 2012. ^ a b Cooper and Bishop 2004, pp 79–80. ^ Cooper, Bishop and Hubers Air Enthusiast No. 117, p. 57. ^ Burdin, Sergey; Dawes, Alan (2006). Tupolev Tu-22: Russia's Pioneering Supersonic Bomber. Barnsley: Pen & Sword Aviation. p. 185. ISBN 1-84415-241-3. ^ Burdin, Sergey; Dawes, Alan (2006). Tupolev Tu-22: Russia's Pioneering Supersonic Bomber. Barnsley: Pen & Sword Aviation. p. 188. ISBN 1-84415-241-3. ^ "Музей дальней авиации, Полтава". doroga.ua. ^ Wilson, Stewart. Combat Aircraft since 1945. Fyshwick, Australia: Aerospace Publications, 2000. p. 138. ISBN 1-875671-50-1.
Cooper, Tom, Farzad Bishop and Arthur Hubers. "Bombed by 'Blinders': Tupolev Tu-22s in Action – Part One". Air Enthusiast, No. 116, March/April 1995. Stamford, UK:Key Publishing. pp. 56–66. ISSN 0143-5450.
Cooper, Tom, Farzad Bishop and Arthur Hubers. "Bombed by 'Blinders': Tupolev Tu-22s in Action – Part Two". Air Enthusiast, No. 117, May/June 1995. Stamford, UK:Key Publishing. pp. 46–57. ISSN 0143-5450. Wikimedia Commons has media related to Tupolev Tu-22. Gordon, Yefim; Rigmant, Vladimir (1998). Tupolev Tu-22 'Blinder' Tu-22M 'Backfire' : Russia's long ranger supersonic bombers. Leicester: Midland Pub. ISBN 1-85780-065-6.